The morning is clear and crisp with a touch of frost on the golf fairways, but the sun is out full bore, lighting up the trees and casting sharp shadows on the grass. We have a superb breakfast in the Radium Springs Hotel. In the office, however, is a notice warning the patrons that a bear had been sighted near the premises, and that we should be cautious. 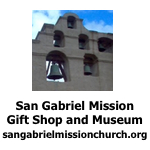 We leave soon after eight. Once again we are on our way, snow-dappled peaks all around us and fields of white daisies everywhere along the roadside. We are soon in the town of Radium Hot Springs, a German oriented village with many chalets. Around the town are saw teeth ridges, their forests and peaks distinct in morning shadows, reminding us of Switzerland. We enter Kootenay National Park where a chipmunk is breakfasting on grass. Flashing electric signs warn of “Bears on Road.” We lower in altitude and travel alongside gurgling Sinclair Creek. At the side of the road three Big Horn Sheep graze in a meadow, adding to our excitement. Some spot a bear on our right, but unfortunately I don’t see it. Our road is like a strip cut through the dense forest, many of the trees birch and aspen. Entering a broad glacial valley, our view is one of bare snowy peaks and spruce forests, the trees slim and tapered like test tube brushes. A deer, frightened by our bus, prances back into the forest. Snow on the rounded peaks lies as smooth as powdered sugar with fingers of white lower down on the slopes. We stop for a stretch on the Kootenay River where we can watch the rapid flow of the gray glacial water, the sun sparkling on its surface. Aside from the spindly spruce, white daises, yellow buttercups and a small violet flower cover the ground around us. It feels as though we are standing in a fresh air paradise. All is not perfect in paradise as we learn when we move on. We come upon areas of vast fire damage where the burned trunks poke up like sharp needles, dead and gray. There are very few signs of regeneration. Avalanche scars have scoured acres of trees from the steep slopes. Chaotic piles of bleached logs lie along the edges of the river. But we also see waterfalls cascading in long ribbons and lush green meadows. We park at a rest stop by the Kootenay River again, close to its bank where we can hear its subdued roar and splashing. In late morning we cross from British Columbia into Alberta, on our way to Lake Louise. Now we follow the Bow River, the culprit in some recent flooding. Fences along the highway protect animals from being hit by cars. Bridges with native vegetation growing on them have also been built over the road to give animals access to the land on the other side. We arrive at Lake Louise before noon. Nearby a light brown grizzly bear forages in the grass and yellow dandelions. A Park Ranger nears him and claps his hands to shoo him away. The bear lopes clumsily away, the fat rippling on his body, then joins other bears in the forest. 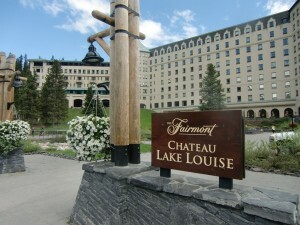 The grand old hotel, the Chateau Lake Louise, stands on the edge of the lake. We walk through its plush interior, but prefer to spend our time outside. We move on to Lake Moraine, formed by a glacial moraine, a glacial-made wall of pushed-up dirt and rock, thousands of years before. We gaze at the quivering blue lake, again with snow-laden peaks beyond. Where the lake empties, among great gray rocks, a vast raft of bleached logs floats on the surface. They are the accumulation of all the trees that have toppled into the lake from its many sources. It is really something to see. We eat lunch at Lake Moraine, but are pestered by chipmunks and Clarke’s Nutcrackers who want to join us. Leaving Lake Moraine in early afternoon, we travel on the Bow Valley Parkway, again following the Bow River. Castle Mountain, composed of limestone and dolomite, rising to nine thousand feet on our left, looks like much the ramparts of a castle. As we pass a bridge an osprey peeks out of its nest, the round leaves of quaking aspen fluttering at the side of the road. Part of the road is inundated, and large ponds with trees standing in them attest to the recent floods. Soon we glide into the city of Banff, but more about that in the next article. 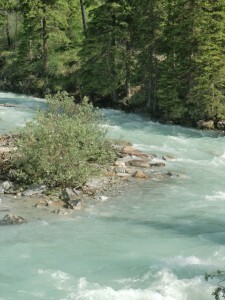 Powdered rock from glacial action gives the Kootenay River its turquoise blue color. 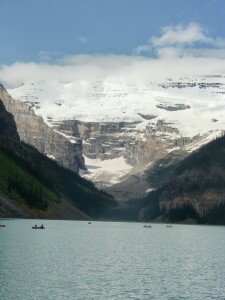 This view of Lake Louise is one of the world's grandest. 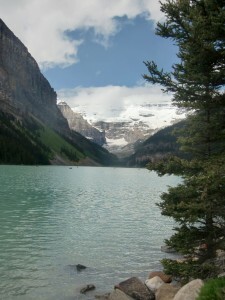 Another view of Lake Louise from the trail that circumnavigates the lake. The elegant Chateau Lake Louise is located right at the edge of the lake.